Cleaning robots for cats, bark translators for dogs and more. Imagine receiving daily Twitter messages from your cat, or viewing digital photographs taken by your dog. Not so long ago, those Dr. Doolittle-like activities might have been laughable. But now, thanks to talented technophiles, if there's a gadget out there for you, in many cases, one for your pet isn't too far behind. According to the American Pet Products Association, Americans are expected to spend about $47.7 billion on their pets this year. And, industry experts say, the opportunities to spend that money on pet-related technology is growing. "The options have definitely increased," said Bob Vetere, president of the APPA. "As people are spending more on iPads and iPhones, marketers realize that the same person is purchasing for the humans and the pets in the household. They're appealing to the same needs in those human purchasers, whether it's for a [human] family member of a pet family member." Some of the pet-friendly gadgets to hit the market may be purely fun and frivolous. But as people work longer hours and spend less time at home, Vetere said, other, more practical, devices try to relieve some of the burdens of pet care. Janice Brown, founder of Tails Pet Magazines, said that even as people cut back on spending for themselves, they continue to pamper their pets. "If someone thinks something is extravagant, it's out," she said. "But a lot of times people don't have kids, they have pets. Your pets are your family." So what kinds of high-tech gear can humans give to their four-legged family members? Below, check out eight of the tech world's craziest, most creative gadgets for pets. Could Technology Help You Communicate With Your Pet? Between fameball Kim Kardashian and starlet Lindsay Lohan, Twitter already hosts its fair share of cat fights. But a new device could take them to a whole new level. Earlier this week, the Tokyo-based Sony Computer Science Laboratories unveiled a device that can connect your kitty to Twitter. According to the news site Tech-On, Sony said the so-called "lifelogging" device is worn around a cat's neck and uses a camera, accelerometer, GPS and Bluetooth technology to record the cat's activities. Using the data gathered by the various sensors, the lightweight device can figure out if the cat is sleeping, walking or eating and then it automatically sends messages directly to a Twitter feed. For example, if it determines that your cat is eating, it might tweet, "This tastes good." So far, only 11 phrases are available, Tech-On said, but the company plans to expand the gadget's vocabulary. But you'll have to wait a bit to read your cat's commentary in 140-words or less. Sony's device is only a prototype for now. Wouldn't you love to know what your pet is thinking? 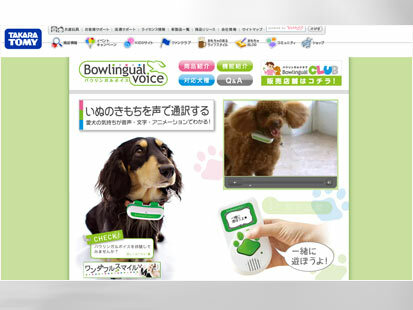 Takara Tomy, a Japanese toy company, says it has created a gadget that can translate dog barks. The Bowlingual Dog Translator includes a microphone worn around a dog's neck and handheld digital reader that the company says translates barks into one of six emotional states: happy, sad, frustrated, threatening, needy or assertive. Some animal experts say dogs' emotions are about as sophisticated as todders', so "translating" barks would provide little insight into their psychology. But the company said it worked with an acoustics laboratory that, according to a press release, provided "research and development and consulting as well as aiding speech, acoustics and radio waves" for the Bowlingual Voice's creation. If you're willing to fork over $222, it can be yours. And if it's Cat-to-English translations that you're interested in, the MeowLingual iPhone app says it can help you understand your feline friends. The app, which comes in free and 99-cent versions, says it records and then analyzes cat meows. But don't expect it to turn you into a Dr. Doolittle. It comes with the disclaimer that it's intended for "novel entertainment" and may not always work. Balls of yarn are so yesterday. If you're looking for something new to entertain your cat, check out the FroliCat Bolt Interactive Laser Pet Toy. 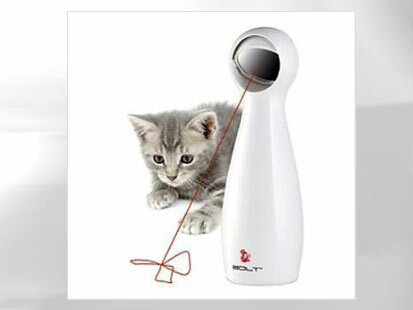 The $19.95 device generates red laser patterns that the company says can amuse even the laziest felines. You can set it to automatic and place it on a flat surface or use the manual mode and hold it in your hand. Did you know that your favorite tunes could be hurting your pets' ears? According to PetAcoustics Inc., because animals have such an acute sense of hearing, sounds in some frequencies can cause them discomfort. To make your music library more agreeable for your pets, earlier this year, the company unveiled what it calls the world's first sound system designed for the hearing sensitivities of cats, dogs and horses. My Pet Speaker connects to range of acoustic devices (such as iPhones, iPods, CD players, etc.) and then generates music in frequencies that don't aggravate the animals. But if you want to share your musical taste with your pet, it'll cost you. The speaker costs $249.95. 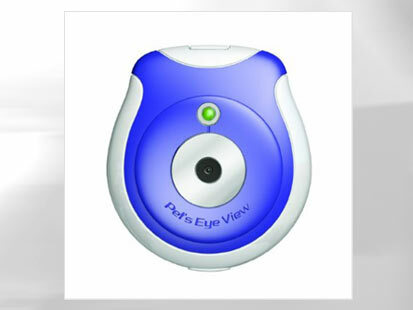 With the Pet's Eye View Digital Camera, you can turn your pet into a shutterbug. The $39.99 device clips on to a cat or dog's collar and documents the world from their perspective. Owners can set the camera so that it snaps pictures every 1, 5 or 15 minutes and then upload them via USB cord to a computer. The camera can store 40 photos. All pet products aren't only meant to amuse. Some actually try to make pet care a little easier for the owner. 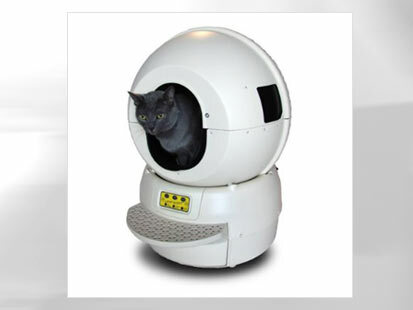 The Litter Robot, by Automated Pet Care Products, Inc., is an automatic, self-cleaning litter box. When a cat steps into the globe-shaped gadget, a weight-activated sensor detects the animal. Seven minutes after the cat steps out, the globe automatically starts spinning and sifting the waste out of the chamber. It drops the cat waste into a lined drawer and then resets the litter box so that the chamber is ready for its next feline visitor. But convenience doesn't come cheap. The Litter Robot is available for $329. If your pet likes to adventure away from home, give yourself some peace of mind with the Zoomback Pet Locator. It attaches to a dog's collar and uses GPS technology to keep track of the animal's location. Anytime you want to identify his location, hop onto to Zoomback.com or use your cell phone. You also can set up safety zones and request e-mail and/or text message notifications when your dog wanders outside of those zones. 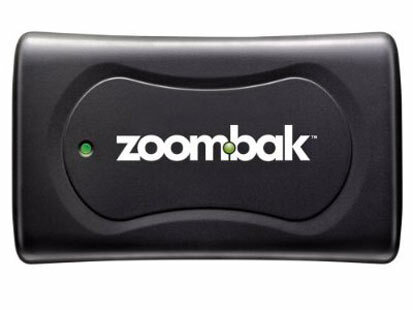 The Zoomback is $99.99, with monthly service fees that start at $12.99. 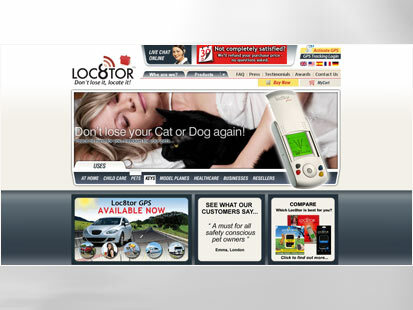 The Pet Loc8tor is another high-tech pet finder, but instead of using GPS technology, it relies on radio frequency to track wayward cats and dogs. The super light tag, weighing only about .18 oz., attaches to the pet's collar and communicates with a credit-card-sized handset. As long as you're within 400 feet of your pet, the handset tells you which direction to walk in to find the pet and, as you get closer, the signal gets stronger and the device gets louder. Veterinarian Marty Becker said the Loc8tor could be especially helpful for owners of cats and other small pets that tend to stay close to home but can easily hide themselves from view. "A lot of time people can't find their pets [inside]," he said. "Cats will go hide inside closets." Devices like this could help owners find their pets even if they're tucked away in cupboards or out-of-reach shelves, he said.